17 1/2 x 26 in. 50 x 33 1/2 in. 36 1/4 x 26 1/4 in. 39 1/4 x 26 in. 49 x 33 1/2 in. 36 1/2 x 18 in. 35 3/4 x 17 5/8 in. 54 x 37 5/8 in. 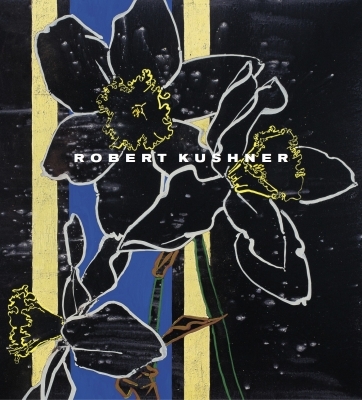 DC Moore Gallery is pleased to present Robert Kushner: Portraits & Perennials. In this exhibition of new paintings and works on paper, Kushner extends the boundaries of his compositions, infusing his iconic, organic imagery with vibrant color and increased geometric precision in a lyrical synthesis of styles and techniques. Underscoring the evocative title of the catalogue’s essay, “Do REAL Men Paint Flowers?,” the exhibition seeks to disrupt the narrative surrounding the decorative while exploring the importance of beauty in contemporary art. In paintings such as Bossa Nova (2015), Ahavah (2016), and Nasturtiums­–Hot Season (2016), Kushner’s defining grid-like backgrounds have grown increasingly pronounced, as he employs a bold, energized palette of brilliant pinks, purples, and yellows that imbue this body of work with new vigor. “…I began to consider how I could introduce a more raucous color sense, and increase of scale of the individual floral and foliate elements so that they might go spilling off the confines of the canvas,” the artist explains. The accompanying catalogue to the exhibition highlights these new developments through a series of thought-provoking questions posed to the artist by notable individuals in fields ranging from the art historical and creative to the spiritual and culinary realms. These included curators and art critics, two museum directors, a poet, a rabbi, a restaurateur, and a diplomat. Their inquiries covered a wide spectrum of Kushner’s artistic concerns and brought new critical insights into the artist’s ongoing body of work. Robert Kushner has exhibited extensively in the United States, Europe, and Japan. Solo exhibitions of his work have been held at the Whitney Museum of American Art and the Brooklyn Museum, in New York, and the Philadelphia Institute of Contemporary Art. His work is featured in public collections such as The Museum of Modern Art, The Metropolitan Museum of Art, and the Whitney Museum of American Art, New York; the National Gallery of Art, Washington, DC; the Philadelphia Museum of Art; the San Francisco Museum of Modern Art; the Tate Modern, London, England; and the Galleria degli Uffizi, Florence, Italy. Publications on Kushner’s work include the monograph Gardens of Earthly Delight (Hudson Hills Press, 1997) with essays by Alexandra Anderson and Holland Cotter, and Wild Gardens by Michael Duncan (Pomegranate, 2006). In 2012, Kushner was the editor of an important volume of art criticism by Amy Goldin (1926-1978) titled Amy Goldin: Art in a Hairshirt (Hudson Hills). Join us at DC Moore Gallery for a special open house. The artist will be present. Light refreshments will be served. Design Arts Daily: "Robert Kushner at DC Moore Gallery"
The Paris Review: "Portraits and Perennials"